An American hospital has offered to bring an experimental drug to the UK to treat terminally-ill Charlie Gard. The hospital in New York has also said it is prepared to admit 11-month-old Charlie if "legal hurdles" can be cleared. It is the latest intervention after US President Donald Trump and Pope Francis offered their help and prayers. Chris Gard and Connie Yates, Charlie's parents, have been fighting a long legal battle with doctors at Great Ormond Street Hospital in London who say the treatment would not help the child. The US hospital said that it would treat Charlie with an experimental drug pending approval from government regulators, the Food and Drug Administration (FDA). In a statement, the hospital said it has "agreed to admit and evaluate Charlie, provided that arrangements are made to safely transfer him to our facility, legal hurdles are cleared, and we receive emergency approval from the FDA for an experimental treatment as appropriate". It added: "Alternatively, if approved by the FDA, we will arrange shipment of the experimental drug to Great Ormond Street Hospital and advise their medical staff on administering it if they are willing to do so." Charlie suffers from a rare genetic condition affecting his mitochondria and doctors say life support should be switched off because there is no possibility of his condition improving. However, a US specialist told judges there was a "small chance" of a meaningful improvement in Charlie's brain function if he had the therapy. The High Court, Court of Appeal and Supreme Court all ruled in favour of Great Ormond Street doctors. 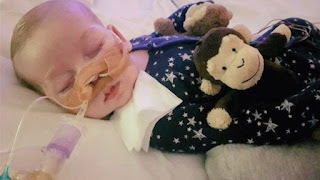 Charlie's parents, both aged in their 30s and from Bedfont, west London, are spending what are expected to be the last days of his life with him. Ms Yates told Good Morning Britain that wondering when he will die was "absolute living hell". "We are not bad parents, we are there for him all the time, we are completely devoted to him and he's not in pain and suffering, and I promise everyone I would not sit there and watch my son in pain and suffering, I couldn't do it."